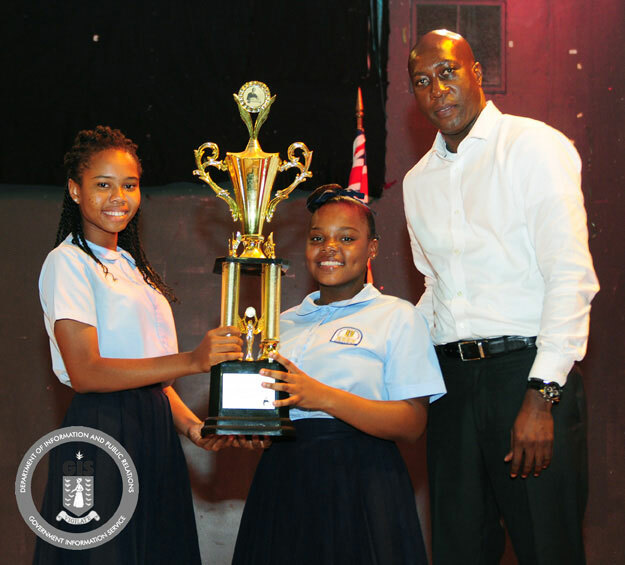 The Elmore Stoutt High School (ESHS) has regained its title as the secondary schools debate champions after defeating the Bregado Flax Educational Centre- Secondary Division. The proposition, Bregado Flax Educational Centre – Secondary Division team was represented by Anika Christopher and Kyiah Hodge, while the opposition Elmore Stoutt was represented by Kiymeiah Millington and Jada Angus. The proposition argued that the rise in international pressure, competition and other factors have resulted in a decline of new corporations in recent years. They also argued that the BVI Financial Services Sector is challenged in the area of responsiveness and its capacity to deliver in a timely manner. They further added that it is costly for the sector to design and implement new financial regulations and enforce these regulations. Meanwhile, the opposition Elmore Stoutt High School argued that the shifting worldwide financial environment will not lead to harmful consequences for the financial services sector in the Virgin Islands. They added that the financial services industry also focuses on insurance, banking, trusty business and other components. The opposition outlined the role of the financial services in the Virgin Islands economy and argued that the Territory had previously adapted to changes which resulted in minimal impact to the industry. The best speaker of the debate was Jada Angus of the Elmore Stoutt High School. The Inter-Secondary Schools Debates provide a platform where students can lend their voice to important, topical issues through clear articulation and rational defense of an idea.